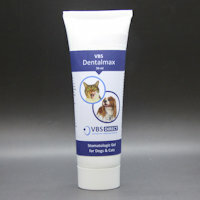 VBS Direct Ltd - VBS Dental Max Toothpaste - Innovative solutions for the veterinary professional. This product is a highly adhesive stomatologic gel, to be used directly or brushed as a toothpaste. It is effective in preventing plaque and tartar build-up, controlling halitosis and strengthening tooth enamel. Its chamomile flavouring makes it well accepted in most of the subjects for ease of repeated applications. Start gradual introduction with your pet and reward it afterwards, once accepted ensure to use toothpaste daily. Apply on teeth and gums and gently brush for about one minute using a toothbrush or a finger-brush for best results. The product is well tolerated in case of ingestion and does not require rinsing. Repeat the application at least daily during 3-week cycles. Application cycles could be repeated depending on veterinarian’s advice.